The Best Grilled Carne Asada Recipe Ever – delicious grilled carne asada perfect for fajitas, tacos, salads, and more! 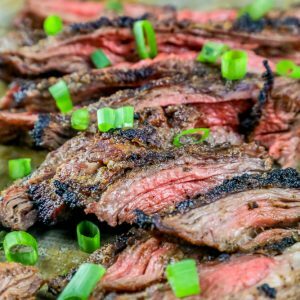 The best easy grilled flank steak carne asada recipe for a keto low carb meal the whole family will love. If you’re looking for the best grilled Mexican food inspired steak recipe, you’re in luck. Delicious Carne Asada Steak is the perfect easy, delicious, and hearty summertime dinner. It’s delicious in fajitas, salads, tacos, and more – and I’m sharing my all time favorite easy authentic carne asada recipe ever today. This is the best authentic grilled carne asada recipe I’ve ever tasted – perfect for tacos, burritos, wraps, salads, fajitas – or just on it’s own for an incredibly juicy grilled Mexican steak dinner the whole family will love. 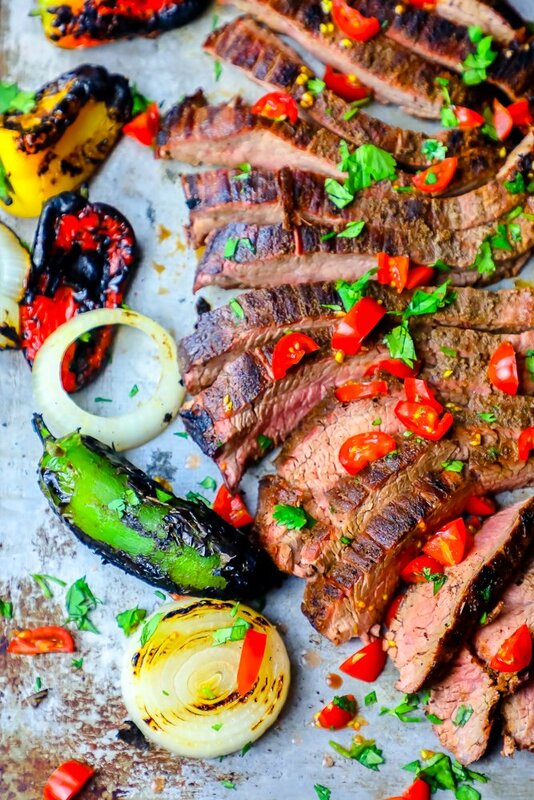 JUST TAKE ME TO THE BEST GRILLED CARNE ASADA RECIPE EVER ALREADY! 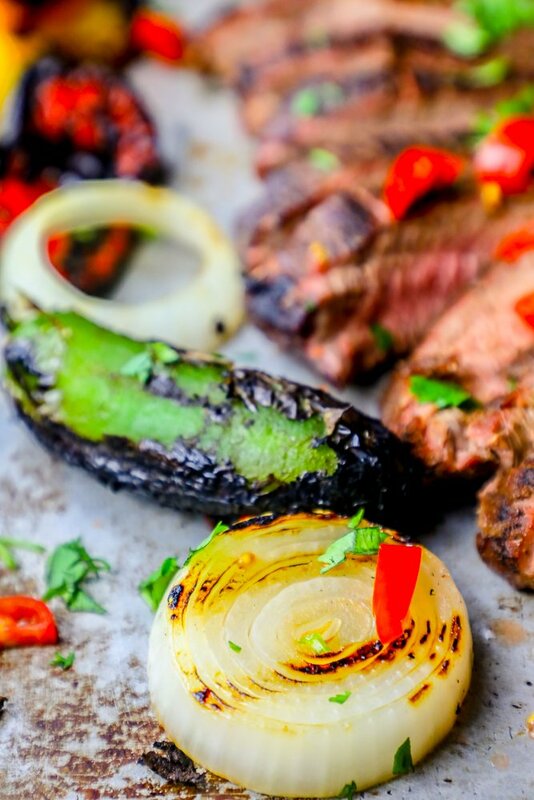 If you’d rather skip my (very helpful, i think) tips and tricks, essential cooking info, and similar recipe ideas – and get straight to this deliciously easy low carb grilled carne asada recipe – simply scroll to the bottom of the page where you can find the printable recipe card. Carne Asada literally transtlates to “grilled beef” – and is a super simple staple of many households. Carne Asada is a simple but versatile marinated and then grilled steak dish that is perfect in tacos, burritos, fajitas, or over salads and in wraps. Since carne asada is marinated in a rich and spicy marinade, it is tender, juicy, and bursting with flavor without having to add anything to it once it touches the grill. Carne asada is one of those dishes everyone has their own authentic take on since so much of grilled carne asada’s flavor comes from marinating the beef before grilling – and one that can easily be adapted to your favorite flavors. What Kind of Beef is Carne Asada? Since carne asada consists of a well-marinated beef steak, you can use tougher steaks that notoriously dry out quickly without worrying about them becoming too tough or dry. While flank steak or skirt steak are the traditional picks for carne asada, you can also use sirloin steak, tenderloin steak, rib steak – or even brisket! Since we’re using tougher cuts of beef with long, lean fibers, it is critical to cut your skirt steak or flank steak properly for tender juicy steak. If you look at your grilled flank steak or skirt steak, you will see long lines running down the steak – you will want to cut against the grains to make them short – which makes them much softer and easier to chew since you’re breaking down the fibers holding the meat together. Slice the grilled steak as thin as possible for the most tender and easy to chew carne asada – and be sure to wait for the steak to rest fully before slicing to help preserve the steak’s natural juices and flavor! If you’re throwing a dinner party or feeding a crowd, carne asada is one of the best steaks you can serve on a budget, since carne asada uses flank steak or skirt steak – or other typically inexpensive and tougher cuts of beef. Typically, skirt steak and flank steak (and other steaks well-suited to carne asada) run $6-$8 per pound, making them some of the most affordable cuts of beef at the market. This makes carne asada an economical choice for family dinners or anytime you’re feeding a lot of mouths! To really cut the cost to serve carne asada, look for flank and skirt steak in your grocer’s bulk case – you can often find bundles of skirt steak for dollars less. If you buy a large amount of flank steak or skirt steak for carne asada, you can whip up a gigantic batch of marinade (I use my vitamix blender since it holds so much), and place each steak in a gallon sized ziploc bag that i fill up with marinade. Simply pop the freezer carne asada marinade bags in the freezer for up to 2 months and pull out when you’re ready for a steak dinner! Let thaw naturally in the refrigerator for 1 day before grilling – using heat to thaw the steak will cook it slightly, resulting in a tougher, drier steak. Carne asada is one of my favorite easy Mexican Steak recipes – since it is so simple and easy. The major steps to a perfect carne asada are simply marinate, then grill – making this a recipe cooks of any skill level can master in no time. While this recipe is super simple, I am including a couple tips and tricks to help you get delicious perfectly cooked Carne Asada every single time! 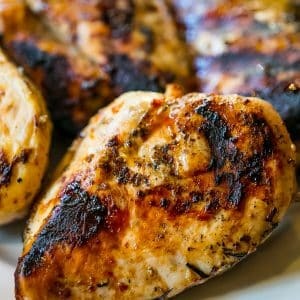 Marinate for at least 5 hours and up to 1 day. We’re using flank steak (or skirt steak) in this carne asada recipe, which can be very tough and dry when not cooked a certain way. 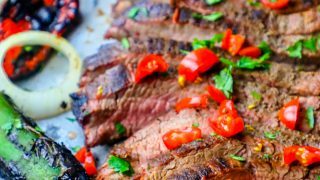 Marinating helps add tons of juicy flavor and makes the flank steak a little more forgiving when grilling so you don’t have to worry about over dry carne asada. To see more tips and tricks and useful information on flank steak and skirt steak, including where skirt steak comes from and where flank steak comes from; why they taste best when marinated; and the best cooking methods for skirt steak and flank steak; please head to my Garlic Grilled Flank Steak Post that is absolutely loaded with information, tips, and tricks to perfect flank steak every time! Flank steak is best when cooked fast and hot. 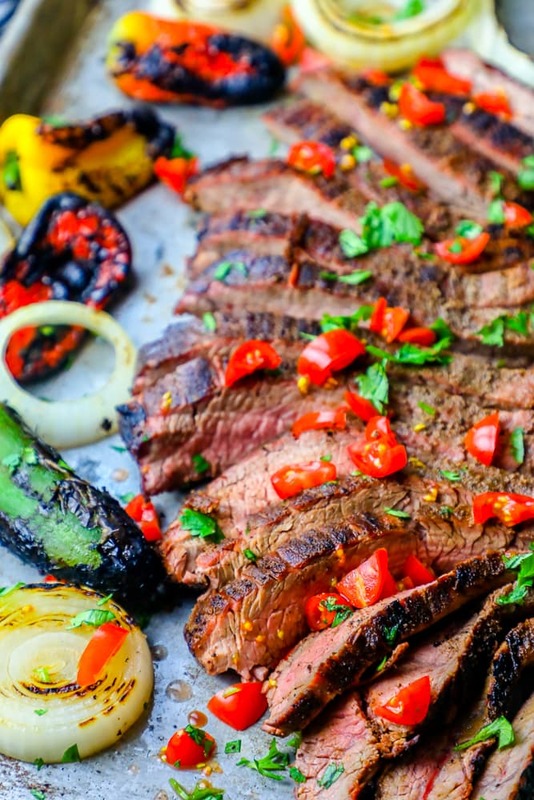 Grilling flank steak shouldn’t take over 15 minutes – so starting with a hot grill is essential! I like to add a spray of olive oil (or a quick wipe across the grates with a paper towel soaked in a little olive oil) before grilling steak. Use extreme caution when oiling grates – oil is extremely flammable, and your grill grates will be HOT! Use tongs or a heatproof glove, and use just a tiny bit of oil on the grates. Grill 3 minutes per side, then flip. Don’t overflip your steak – if you don’t let it get a delicious char on each side, it will taste rubbery and flabby. I like to let steak sit on grates for about 3 minutes in between flipping – enough time to let a char develop, but not enough time to overcook the outside of the steak while the middle is still very raw. Cook steak to your preferred temp – I prefer a more rare medium-rare – which takes just over 10 minutes on a hot grill. For medium, it will be closer to 14 or 15 minutes. Let carne asada rest for at least 10 minutes after grilling. 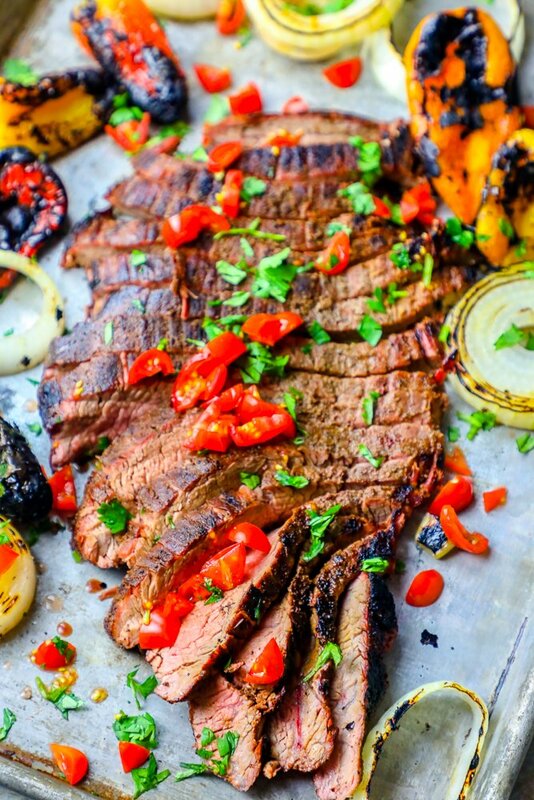 This is one of the most important steps to keep a delicious, tender, and juicy grilled carne asada – if you cut the flank steak too quickly after grilling, all of the juices will run out, making the meat seize up and taste dry and tough. Let carne asada rest for at least 10 minutes, under foil, for the most flavorful and juicy steak. Carne asada is a simple dish to serve – great for groups, dinner parties, sunday suppers, or just a backyard hangout. 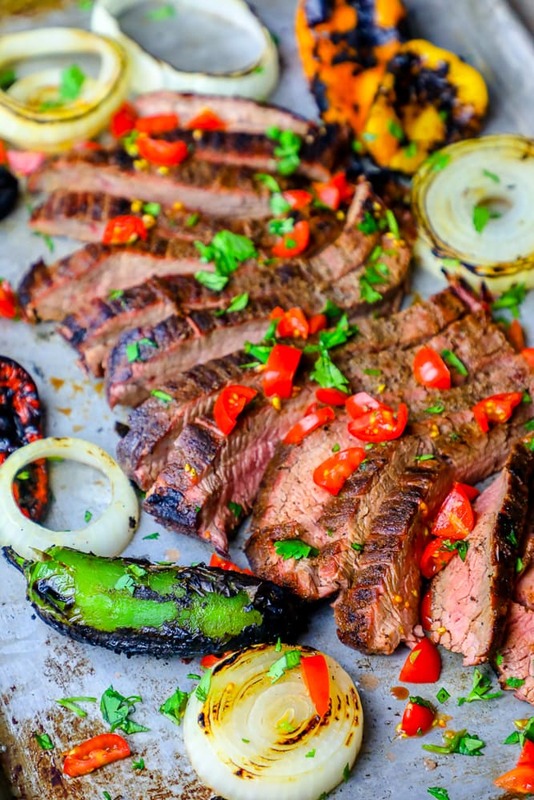 It is crazy versatile and goes with so many dishes – so have fun finding your favorite way to make this grilled Mexican steak! 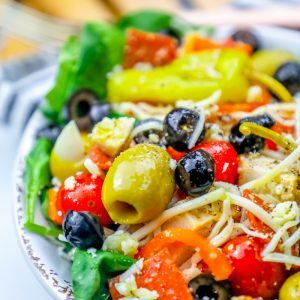 Set out lettuces, grilled vegetables, salsas, cheeses, avocados or guacamole and sour cream, as well as sliced carne asada for a low carb/keto grilled carne asada salad bar that is perfect for parties! Arrange burritos, beans, grilled fajita vegetables, avocados, cilantro lime rice, guacamole, and cheese for a make your own Chipotle Copycat Grilled Steak Burritos! Slice and layer over your favorite taco salad recipe. Use large butter, iceberg, or romaine lettuce leaves as “wraps” with grilled vegetables, beans, and steak for delicious grilled carne asada lettuce wraps that are fun to eat, low calorie, and low carb! 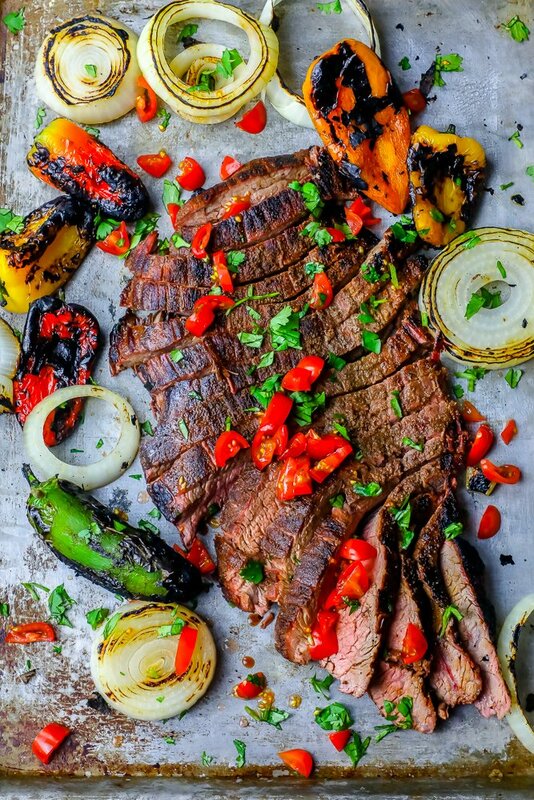 I am making this grilled Carne Asada recipe with some of my favorite easy grilled vegetables – onions, peppers, and jalapenos for a super simple grilled carne asada fajitas recipe you will love. Carne asada is also deliciously hearty and addictive on it’s own too with beans and rice, or grilled vegetables. You can even use my best ever cauliflower rice recipe and easy keto jalapeno cheddar bread to make the best keto grilled carne asada tacos! Don’t miss my Chipotle Knockoff Cilantro Lime Rice and Restaurant Style Instant Pot Pinto Beans for two delicious sides perfect for carne asada! 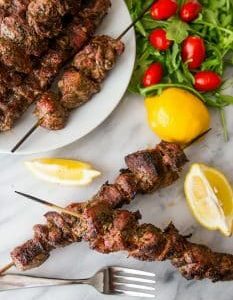 If you love this easy grilled carne asada dinner, be sure to check out some of my other favorite grilled low carb meals the whole family will love! 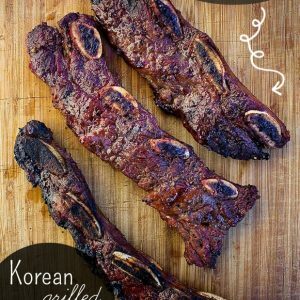 If you love the Best Grilled Carne Asada Recipe Ever as much as I do, please write a five star review, and be sure to help me share on facebook and pinterest! Place flank steak on cutting board and remove any silver skin or excess fat. 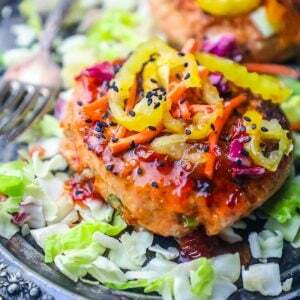 In a blender, mix all marinade ingredients. Add steak and marinade to ziploc bag or covered bowl and marinate at least 5 hours, preferably 12-24 hours. Add steaks and vegetables to grill and flip every 3 minutes until desired doneness - for medium rare, it will take about 10-12 minutes. Remove from grill and place on cookie sheet or cooling rack, tented with foil. Let rest at least 10 minutes. Slice steak against the grain into thin strips. The colors here are ravishing! Can’t wait to try this beautiful combination of ingredients! Seriously the best meat! It tastes incredible! Now my stomach is growling! This looks so delicious. Carne asada is my go to menu choice at Mexican restaurants. Really excited to make it at home! Carne Asada is so delicious! This looks so tender & juicy. Can’t wait to try this! It’d be great for so many recipes! Wow this looks sooooo juicy! Love it!